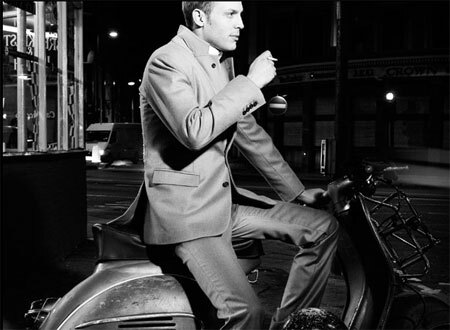 The word ‘Mod’ is big business these days, so its no surprise to see the more mainstream fashion scene jumping in on the act, The Mod Suit by Social Suicide being one example. Irrespective of the suit itself, the idea and the range is actually quite interesting, featuring youth cult looks over the years, including the Teddy Boy, Mod, Rocker, Peanut, Beetle and Rudi, with each inspiring a handmade suit/outfit with the kind of detailing you’ll usually expect at a tailor. A new British film Clubbed, set in the early 1980s, has a very intriguing soundtrack we felt you should know about. The plot of the film is essence the story of a lost factory worker seeking redemption in the murky world of nightclubs and gangland. It stars Mel Raido as the central character (best known for his recent work depicting Harry Roberts in the ITV series He Kills Coppers). You can see the trailer for the film below. As a description ‘gritty’ pretty much covers it. What is of most interest, however, is the soundtrack, which features a selection of ska, northern soul, and funk classics. Of the former you get to hear songs by Jackie Mittoo, Roland Alphonso and Nine Ton Peanut Smugglers, and for the latter we get to hear some obscure sounds by acts such as Bob Relf, Sam Dees, Carol Anderson, Bobby Hutton, Tony Cook, Bobby Purify, Lorraine Johnson, Dorothy Norwood, and David Batiste. The film is released in the UK and across Europe on January 16th 2009. You can visit the official movie site here. Now here is an album with a stellar line-up of 60s legends that almost never came out. 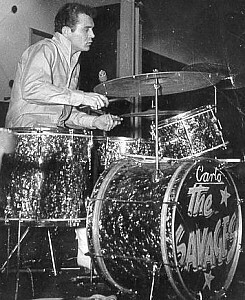 Carlo Little was a ’60s drumming legend. He played with The Savages, Cyril Davies All Stars, The Rolling Stones and The Hoochie Coochie Men amongst many other favourites of the beat era. In 2000 Little recorded an album with some of his old 60s contemporaries. However shortly afterward he fell ill and eventually died in 2005. The album languished unheard for many years, but next month is finally released. Carlo Little All Stars, as the band was called, recorded ‘Never Stop Rockin’ over several sessions. The line-up featured Rick Brown and Ron Wood (The Rolling Stones), Art Wood (The Artwoods), Long John Baldry, Matthew Fisher (Procol Harum), and Geraint Watkins (Bill Wyman’s Rhythm Kings). The album is released on January 12th, and is available to order from Amazon here. A launch party for the album takes place at the Eel Pie Club in London on March 4th. The official Carlo Little website can be visited here. 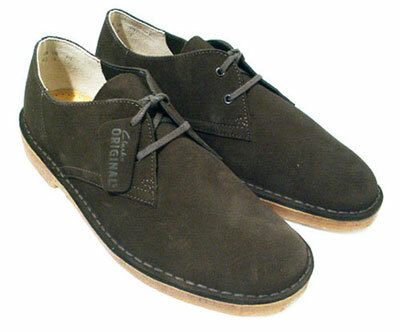 Interesting twist on a classic – the Clarks Desert Khan 2 Shoes. Yes, your eyes don’t deceive you, this is a stripped-down version of the 50s classic, turning it into a shoe, throwing in some premium suede in two shades at the same time. A love or hate thing, I’m sure. Just out in Japan, there’s every chance these will make it to the UK sometime next year. If you can’t wait, check out the Atmos online store. 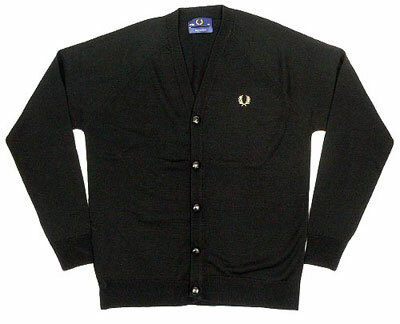 It’s cardigan weather – and new out from Fred Perry is this Football Cardigan. No, it’s not designed for wearing at the match (although you could), the name is down to the buttons – the chunky, vintage-style black leather ‘football’ buttons. Aside from that, there’s a gold laurel on a black lambswool cardigan and a high fasten.